In Hollywood right now, they’re rolling out the red carpet, pinning back the stage curtains, and polishing those familiar gold statues in preparation for this year’s Oscars. Meanwhile, across the pond, Agent Ade is rolling out the wood chippings, pinning back the polytunnel, and laying out his precious onion sets. Ladies and Gentlemen, welcome to the glitz and glamour of Plot 23d. This weekend was the official opening of my polytunnel growing season 2017. Not discouraged by the lack of paparazzi, allotment celebrities or designers wanting to know where I got my threadbare sweater from, I rolled up my sleeves and got down to business. Clearing out last year’s rubbish, sweeping clean the floor, and putting up the tables, I began to feel the thrill of spring. The plans created in those dark winter months could now begin to see the light. First on this year’s polytunnel guest list: the onions. Red Baron, Stuttgarter Giant, Rosana and Shallot Golden Gourment. Along with their leek seedling entourage, this was one classy display, guaranteed to bring tears to your eyes. It was imperative they received the VIP treatment with first-class compost and module trays. Up until two years ago, I always planted my onion sets straight out. However, having lost my crop to the dreaded onion fly in 2015, I’ve since changed tack. 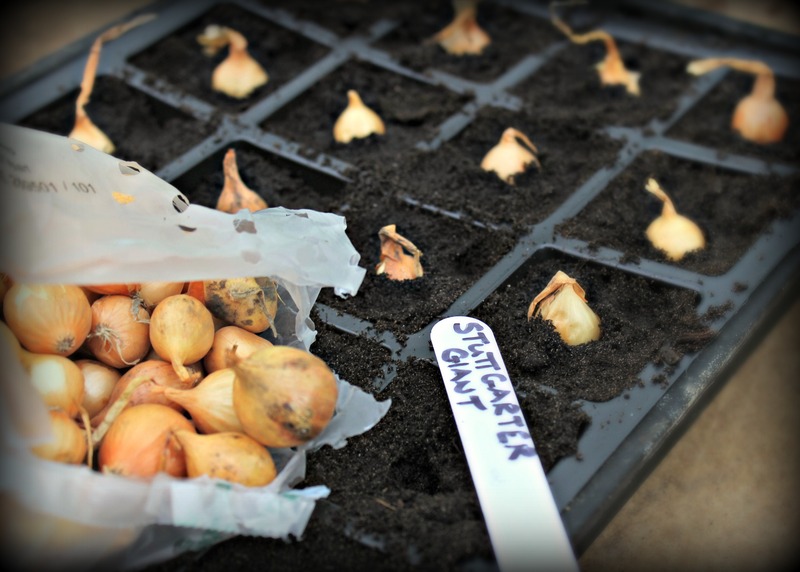 Placing them in modules for a month or so helps them to establish a strong root system and give my allium beauties a fighting chance. 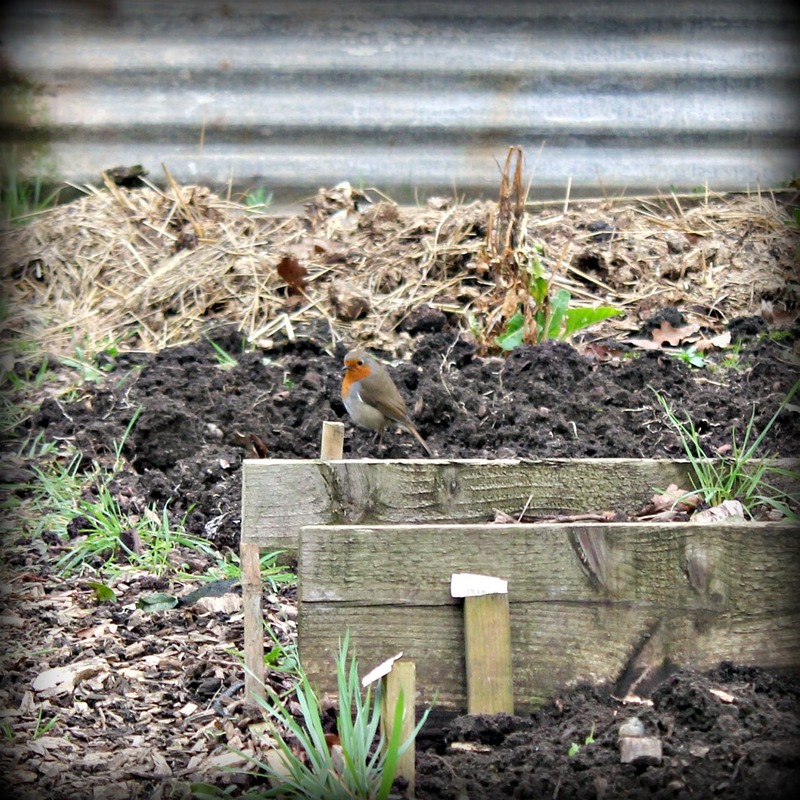 Unlike seeds, I don’t worry about sieving the compost; they’re already established, so won’t suffer from the compost’s rough and tumble. However, I do create a hole in the compost, centre of the module, which will bed the onion set halfway down. That way I’m not damaging the roots when I push it in. 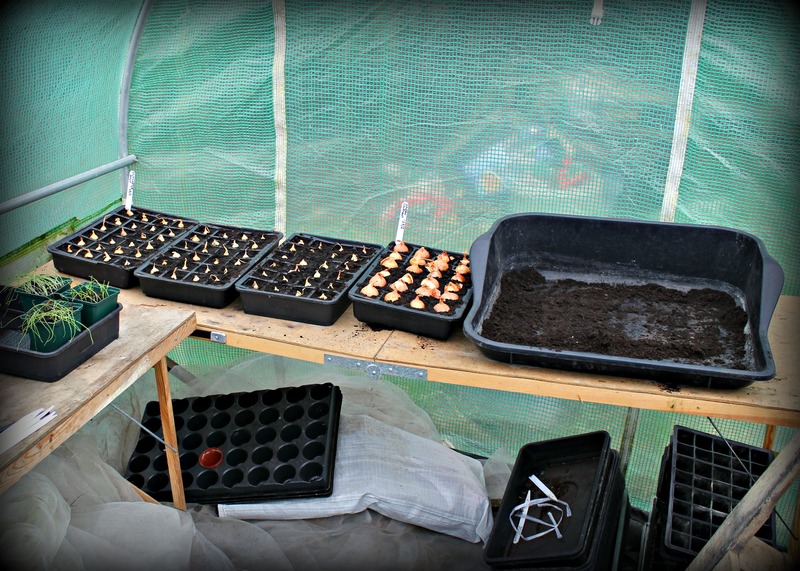 After that, it’s just about keeping the trays moist and ensuring they get plenty of sunlight. By the time they’re ready to go into their final positions, the ground will be warming up, which will speed up growth. With strong roots and a fleecy coat, they’ll outshine the evil double act of Onion Fly and his supporting artist, Allium Leaf Miner. But eyes weren’t just on the onions this weekend, there were other winners. Spring flowers held their own with their latest looks and an array of colours. Flirting with the camera, they had clearly come to make a statement. With the ceremony over, it was time to move onto the famous after-show party: a cup of tea and a freshly-baked brownie, care of Agent Soph. Who said being a gardener wasn’t glamorous? I look forward to this event every year. Never disappoints! Bravo! On a more serious note, I thank Ceres or whoever we don’t have your onion pests. So far….